Bytehouse Knowledge Base - How to Search for a File in Linux? 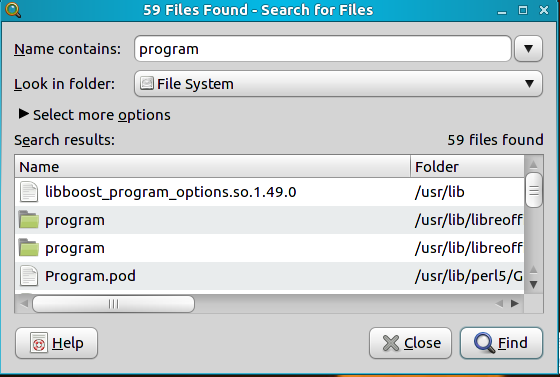 There are different methods for locating a file in Linux. A few methods are listed below. 'find' searches for files in a directory hierarchy. To search for a file, login to your linux server and open a terminal ( Applications >> Accessories >> Terminal) and type the following command. eg: find . -name "filename"
To search for a file in the whole system. This will search the whole system for any files named "filename" and display their pathnames. To find a file in a particular location specify the path. eg: find /home -name "filename"
for any files named "filename" and shall display it. The locate command finds files by name. Add '-i' option to perform a case-insensitive search. Locate the executable file associated with a given command. 'which' command does not follow symbolic links. -a Print all matching pathnames of each matching filename. 1. "Start" button in main toolbar -> "Search" -> "Search for files"
2. Enter the location (folder) and "filename".